The United States Federal Bureau of Investigation (FBI) operates 56 field offices in major cities throughout the United States. Many of these offices are further subdivided into smaller resident agencies which have jurisdiction over a specific area. These resident agencies are considered to be part of the primary field offices. FBI Headquarters, located in Washington, D.C., controls the flow of the agents and support staff that work out of the field offices across the country. Each field office is overseen by a Special Agent in Charge (SAC), except those located in Los Angeles, New York City, and Washington, D.C., which due to their large size are managed by an Assistant Director in Charge (ADIC), assisted by SACs responsible for specific programs or departments. Birmingham: Serves the counties of Bibb, De Kalb, Lauderdale, St. Clair, Blount, Etowah, Lawrence, Shelby, Calhoun, Fayette, Limestone, Sumter, Cherokee, Franklin, Madison, Talladega, Clay, Greene, Marion, Tuscaloosa, Cleburne, Jackson, Marshall, Walker, Colbert, Jefferson, Morgan, Winston, Cullman, Lamar and Pickens. Four Resident Agencies in Florence, Gadsden, Huntsville and Tuscaloosa. Mobile: Serves the counties of Autauga, Coffee, Geneva, Monroe, Baldwin, Conecuh, Hale, Montgomery, Barbour, Coosa, Henry, Perry, Bullock, Covington, Houston, Pike, Butler, Crenshaw, Lee, Randolph, Chambers, Dale, Lowndes, Russell, Chilton, Dallas, Macon, Tallapoosa, Choctaw, Elmore, Marengo, Washington, Clarke, Escambia, Mobile and Wilcox. Five Resident Agencies in Auburn, Dothan, Monroeville, Montgomery, and Selma. Anchorage: Entire state. Two Resident Agencies in Fairbanks and Juneau. Phoenix: All counties except part of the Navajo Nation within Apache County which is served by Albuquerque, New Mexico. Resident agencies in Flagstaff, Lake Havasu City, Lakeside, Sierra Vista, Tucson, and Yuma. Little Rock: Entire state. Resident agencies in El Dorado, Fayetteville, Fort Smith, Hot Springs, Jonesboro, Marion, Pine Bluff and Texarkana. Los Angeles: Serves Camp Roberts, Edwards Air Force Base and the counties of Los Angeles, Orange, San Bernardino, San Luis Obispo, Santa Barbara, Riverside, and Ventura. Resident Agencies in Lancaster, LAX, Long Beach, Palm Springs, Riverside, Santa Maria, Santa Ana, Ventura, Victorville and West Covina. Located inside the Wilshire Federal Building. San Diego: Serves the counties of Imperial and San Diego. Resident agencies in Imperial and North County. San Francisco: Serves the counties of: Alameda, Contra Costa, Del Norte, Humboldt, Lake, Marin, Mendocino, Monterey, Napa, San Benito, San Francisco, Santa Clara, Santa Cruz, San Mateo and Sonoma. Resident agencies in Concord, Fortuna, Monterey Bay, Oakland, Palo Alto, San Jose and Santa Rosa. Denver: Serves all counties and the state of Wyoming. Resident agencies in Casper, Cheyenne, Colorado Springs, Durango, Fort Collins, Glenwood Springs, Grand Junction, Jackson Hole, Lander and Pueblo. New Haven: Entire state. Resident agencies in Bridgeport, Meriden and New London. Jacksonville: Serves the counties of Alachua, Escambia, Lafayette, St. Johns, Baker, Flagler, Lake, Santa Rosa, Bay, Franklin, Leon, Sumter, Bradford, Gadsden, Levy, Suwannee, Calhoun, Gilchrist, Liberty, Taylor, Citrus, Gulf, Madison, Union, Clay, Hamilton, Marion, Volusia, Columbia, Holmes, Nassau, Wakulla, Dixie, Jackson, Okaloosa, Walton, Duval, Jefferson, Putnam, and Washington. Resident agencies in Daytona Beach, Fort Walton Beach, Gainesville, Ocala, Panama City, Pensacola, and Tallahassee. Miami (Miramar): Serves the counties of Broward, Highlands, Indian River, Monroe, Palm Beach, Miami-Dade, Martin, Okeechobee, and St. Lucie. Resident agencies in Fort Pierce, Homestead, Key West and West Palm Beach. Tampa (FBI Tampa Field Office): Serves the counties of Brevard, Hardee, Manatee, Pinellas, Charlotte, Hendry, Orange, Polk, Collier, Hernando, Osceola, Sarasota, De Soto, Hillsborough, Pasco, Seminole, Glades, and Lee. Resident agencies in Clearwater, Fort Myers, Lakeland, Melbourne, Naples, Orlando and Sarasota. Atlanta (Chamblee): (FBI Atlanta Field Office) Entire state. Resident agencies in Albany, Athens, Augusta, Brunswick, Columbus, Dalton, Gainesville, Hartsfield-Jackson International Airport, Macon, Rome, Savannah, Statesboro, Thomasville and Valdosta. Chicago: Serves the counties of Boone, Grundy, La Salle, Whiteside, Carroll, Jo Daviess, Lee, Will, Cook, Kane, McHenry, Winnebago, De Kalb, Kendall, Ogle, Du Page, Lake, and Stephenson. Resident agencies in Lisle, Orland Park, Rockford, and Rolling Meadows. Springfield: All other counties in Illinois. Resident agencies in Champaign, Decatur, Fairview Heights, Marion, Peoria and Quad Cities. Indianapolis: Entire state. Resident agencies in Bloomington, Evansville, Fort Wayne, Lafayette, Merrillville, Muncie, New Albany, South Bend and Terre Haute. Louisville: Entire state. Resident agencies in Bowling Green, Covington, Hopkinsville, Lexington, London, Owensboro and Pikeville. New Orleans: Entire state. Resident agencies in Alexandria, Baton Rouge, Lafayette, Lake Charles, Monroe and Shreveport. The FBI Field Office in Chelsea, Massachusetts. Boston (Chelsea): Serves all counties and the states of Maine, New Hampshire, and Rhode Island. Resident agencies in Augusta, Bangor, Bedford (NH), Lakeville (MA), Lowell (MA), Portland (ME), Portsmouth, Springfield, Providence (RI) and Worcester. Detroit: Entire state. Resident agencies in Ann Arbor, Bay City, Clinton Township, Flint, Grand Rapids, Kalamazoo, Lansing, Marquette, St. Joseph, Traverse City and Troy. Minneapolis (Brooklyn Center): Serves all counties and the states of North Dakota and South Dakota. Fifteen resident agencies, in Aberdeen, Bemidji, Bismarck, Duluth, Fargo, Grand Forks, Mankato, Minot, Pierre, Rapid City, Rochester, Sioux Falls, St. Cloud and St. Paul. Jackson: Entire state. Resident agencies in Columbus, Gulfport, Hattiesburg, Meridian, Oxford, Pascagoula, and Southaven. Kansas City: Serves all of Kansas and the Missouri counties of Andrew, Atchison, Barry, Barton, Bates, Benton, Boone, Buchanan, Caldwell, Callaway, Camden, Carroll, Cass, Cedar, Christian, Clay, Clinton, Cole, Cooper, Dade, Dallas, Daviess, De Kalb, Douglas, Gentry, Greene, Grundy, Harrison, Henry, Hickory, Holt, Howard, Howell, Jackson, Jasper, Johnson, Laclede, Lafayette, Lawrence, Livingston, McDonald, Mercer, Miller, Moniteau, Morgan, Newton, Nodaway, Oregon, Osage, Ozark, Pettis, Platte, Polk, Pulaski, Putnam, Ray, Saline, St. Clair, Stone, Sullivan, Taney, Texas, Vernon, Webster, Worth and Wright. Resident agencies in Garden City, Jefferson City, Joplin, Manhattan, St. Joseph, Springfield, Topeka and Wichita. St. Louis: The city of St. Louis and the counties of Adair, Audrain, Bollinger, Butler, Cape Girardeau, Carter, Chariton, Clark, Crawford, Dent, Dunklin, Franklin, Gasconad, Iron, Jefferson, Knox, Lewis, Lincoln, Linn, Macon, Madison, Maries, Marion, Mississippi, Monroe, Montgomery, New Madrid, Pemiscot, Perry, Phelps, Pike, Ralls, Randolph, Reynolds, Ripley, Sainte Geneviev, Schuyler, Scotland, Scott, Shannon, Shelby, St. Charles, St. Francois, St. Louis, Stoddard, Warren, Washington and Wayne. Resident agencies in Cape Girardeau, Kirksville and Rolla. Omaha: Serves all counties and the state of Iowa. Resident agencies in Cedar Rapids, Des Moines, Grand Island, Lincoln, North Platte, Quad Cities, Sioux City and Waterloo. Las Vegas: Entire state. Resident agencies in Elko, Reno and Stateline. Newark: Serves all counties except Camden, Gloucester, and Salem, which are handled by the Philadelphia field office. Resident agencies in Atlantic City, Franklin Township, Paterson, Red Bank and Trenton. Albuquerque: Serves all counties and the Navajo Nation. Resident agencies in Farmington, Gallup, Las Cruces, Roswell and Santa Fe. Buffalo (FBI Buffalo Field Office): Serves the counties of Allegany, Cattaraugus, Chautauqua, Chemung, Erie, Genesee, Livingston, Monroe, Niagara, Ontario, Orleans, Schuyler, Seneca, Steuben, Wayne, Wyoming and Yates. Resident agencies in Elmira, Jamestown and Rochester. New York City: Serves the City of New York (counties of the Bronx, New York, Richmond, Queens & Kings) and the counties of Dutchess, Nassau, Orange, Putnam, Rockland, Suffolk, Sullivan and Westchester. Resident agencies in Brooklyn, Goshen, JFK Airport, Melville and Rye (formerly located in White Plains). Charlotte: Entire state. Resident agencies in Asheville, Fayetteville, Greensboro, Greenville, Hickory, Raleigh, and Wilmington. Cincinnati: Serves the counties of Adams, Athens, Belmont, Brown, Butler, Champaign, Clark, Clermont, Clinton, Coshocton, Darke, Delaware, Fairfield, Fayette, Franklin, Gallia, Greene, Guernsey, Hamilton, Harrison, Highland, Hocking, Jackson, Jefferson, Knox, Lawrence, Licking, Logan, Madison, Meigs, Miami, Monroe, Montgomery, Morgan, Morrow, Muskingum, Noble, Perry, Pickaway, Pike, Preble, Ross, Scioto, Shelby, Union, Vinton, Warren, and Washington. Resident agencies in Athens, Cambridge, Columbus, Dayton and Portsmouth. Cleveland (FBI Cleveland Field Office): Serves the counties of Allen, Fulton, Mahoning, Seneca, Ashland, Geauga, Marion, Stark, Ashtabula, Hancock, Medina, Summit, Auglaize, Hardin, Mercer, Trumbull, Carroll, Henry, Ottawa, Tuscarawas, Columbiana, Holmes, Paulding, Van Wert, Crawford, Huron, Portage, Wayne, Cuyahoga, Lake, Putnam, Williams, Defiance, Lorain, Richland, Wood, Erie, Lucas, Sandusky, and Wyandot. Resident agencies in Akron, Canton, Lima, Mansfield, Painesville, Sandusky, Toledo and Youngstown. Oklahoma City: Entire state. Resident agencies in Ardmore, Durant, Elk City, Lawton, Muskogee, Norman, Stillwater, Tulsa and Woodward. Portland: Entire state. Resident agencies in Bend, Eugene, Medford, Pendleton and Salem. Philadelphia: Serves the Pennsylvania counties of Adams, Berks, Bradford, Bucks, Cameron, Carbon, Centre, Chester, Clinton, Columbia, Cumberland, Delaware, Dauphin, Franklin, Fulton, Huntingdon, Juniata, Lackawanna, Lancaster, Lebanon, Lehigh, Luzerne, Lycoming, Mifflin, Monroe, Montour, Montgomery, Northampton, Northumberland, Perry, Philadelphia, Pike, Potter, Schuylkill, Snyder, Sullivan, Susquehanna, Tioga, Union, Wayne, and Wyoming, and the New Jersey counties of Camden, Gloucester, and Salem. Eight resident agencies, in Allentown, Cherry Hill, Fort Washington, Harrisburg, Newtown Square, Scranton, State College and Williamsport. Pittsburgh: Serves all of West Virginia and the Pennsylvania counties of Allegheny, Armstrong, Beaver, Bedford, Blair, Butler, Cambria, Clarion, Clearfield, Crawford, Elk, Erie, Fayette, Forest, Green, Indiana, Jefferson, Lawrence, McKean, Mercer, Somerset, Venango, Warren, Washington, and Westmoreland. Ten resident agencies, in Beckley, Charleroi, Charleston, Clarksburg, Cranberry Township, Erie, Huntington, Johnstown, Martinsburg and Wheeling. San Juan: Serves the U.S. commonwealths of Puerto Rico and the U.S. Virgin Islands. Resident agencies in Aguadilla, Fajardo, Ponce, St. Croix and St. Thomas. Exterior of the FBI Columbia field office. Columbia (FBI Columbia field office): Entire state. Regional offices in Aiken, Charleston, Florence, Greenville, Hilton Head, Myrtle Beach, Rock Hill and Spartanburg. Memphis: Serves the counties of Benton, Cannon, Carroll, Cheatham, Chester, Clay, Crockett, Cumberland, Davidson, DeKalb, Decatur, Dickson, Dyer, Fayette, Fentress, Gibson, Giles, Hardeman, Hardin, Haywood, Henderson, Henry, Hickman, Houston, Humphreys, Jackson, Lake, Lauderdale, Lawrence, Lewis, Macon, Madison, Marshall, Maury, McNairy, Montgomery, Obion, Overton, Perry, Pickett, Putnam, Robertson, Rutherford, Shelby, Smith, Stewart, Sumner, Tipton, Trousdale, Wayne, Weakley, White, Williamson and Wilson. Resident agencies in Clarksville, Columbia, Cookeville, Jackson, and Nashville. Dallas: Serves the counties of: Dallas, Allen, Ellis, Kaufman, Navarro, Brown, Callahan, Eastland, Fisher, Haskell, Howard, Jones, Mills, Mitchell, Nolan, Shackelford, Stephens, Stonewall, Taylor, Throckmorton, Armstrong, Briscoe, Carson, Castro, Childress, Collingsworth, Dallam, Deaf Smith, Donley, Gray, Hall, Hansford, Hartley, Hemphill, Hutchinson, Lipscomb, Moore, Ochiltree, Oldham, Parmer, Potter, Randall, Roberts, Sherman, Swisher, Wheeler, Comanche, Erath, Hood, Johnson, Palo Pinto, Parker, Tarrant, Wise, Collin, Denton, Hunt, Rockwall, Bailey, Brown, Cochran, Crosby, Dawson, Dickens, Floyd, Gaines, Garza, Hale, Hockley, Kent, lamb, Lubbock, Lynn, Motley, Scurry, Terry, Yoakum, Angelina, Houston, Nacogdoches, Polk, Sabine, San Augustine, Shelby, Trinity, Tyler, Brown, Coke, Coleman, Concho, Crockett, Glasscock, Irion, Menard, Reagan, Runnels, Schleicher, Sterling, Sutton, Tom Green, Cooke, Delta, Fannin, Grayson, Lamar, Bowie, Camp, Cass, Franklin, Hopkins, Morris, Red River, Titus, Anderson, Cherokee, Gregg, Harrison, Henderson, Marion, Panola, Rains, Rusk, Smith, Upshur, Van Zandt, Wood, Archer, Baylor, Clay, Cottle, Foard, Hardeman, Jack, King, Knox, Montague, Wichita, Wilbarger and Young. Twelve resident agencies, in Abilene, Amarillo, DFW Airport, Fort Worth, Frisco, Lubbock, Lufkin, San Angelo, Sherman, Texarkana, Tyler and Witchita Falls. El Paso: Serves the counties of: El Paso, Culberson, Hudspeth, Andrews, Brewster, Crane, Ector, Jeff Davis, Loving, Martin, Midland, Pecos, Presidio, Reeves, Upton, Ward and Winkler. Two resident agencies, in Alpine and Midland. Houston: Serves the counties of: Harris, Hardin, Jasper, Jefferson, Liberty, Newton, Orange, Austin, Brazos, Colorado, Fayette, Grimes, Madison, Waller, Montgomery, San Jacinto, Walker, Aransas, Bee, Brooks, Duval, Jim Wells, Kenedy, Kleburg, Live Oak, Nueces, San Patricio, Brazoria, Chambers, Fort Bend, Galveston, Matagorda, Wharton, Calhoun, Goliad, DeWitt, Jackson, Lavaca, Refugio and Victoria. Six resident agencies, in Beaumont, Bryan, Corpus Christi and Texas City. San Antonio: Serves the counties of: Atascosa, Bandera, Bexar, Comal, Frio, Gillespie, Gonzalez, Guadalupe, Karnes, Kendall, Kerr, Kimble, Mason, Medina, Real, Uvalde, Wilson, Bastrop, Blanco, Burleson, Burnett, Caldwell, Hays, Lampasas, Lee, Llano, McCullough, San Saba, Travis, Washington, Williamson, Cameron, Willacy, Dimmitt, Edwards, Kinney, Maverick, Terrell, Val Verde, Zavala, Jim Hogg, LaSalle, McMullen, Webb, Zapata, Hidalgo, Starr, Bell, Bosque, Coryell, Falls, Freestone, Hamilton, Hill, Leon, Limestone, McLennan, Milam and Robertson. Six resident agencies, in Austin, Brownsville, Del Rio, Laredo, McAllen and Waco. Salt Lake City: Serves all counties, Yellowstone National Park, and the states of Idaho and Montana. Resident agencies in Billings, Boise, Bozeman, Coeur d'Alene, Glasgow, Great Falls, Havre, Helena, Kalispell, Lewiston, Missoula, Monticello, Ogden, Pocatello, Provo, Shelby, St. George and Vernal. Richmond: Serves Dahlgren Naval Center, Fort A. P. Hill and all cities and counties not covered by either the Norfolk or Washington, D.C. office. Resident agencies in Bristol, Charlottesville, Fredericksburg, Lynchburg, Roanoke, and Winchester. Washington, D.C.: District of Columbia and the Navy Annex, plus the Virginia counties of Fauquier, Arlington, Prince William, Fairfax (City and County) and Loudoun. It also serves cities and towns including Quantico, Warrenton, Falls Church, Alexandria, Manassas, Leesburg and Vienna. One resident agency, in Manassas. Seattle: Entire state. Resident agencies in Bellingham, Everett, Olympia, Silverdale, Spokane, Tacoma, Tri-Cities, Vancouver and Yakima. Milwaukee: Entire state. Resident agencies in Eau Claire, Green Bay, La Crosse, Madison and Wausau. 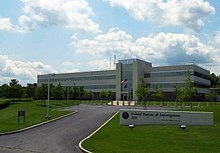 Wikimedia Commons has media related to Federal Bureau of Investigation buildings. This page was last edited on 6 April 2019, at 17:19 (UTC).